The value of Phnom Penh housing investments approved by the government from January to October has risen more than 10 percent, compared to the same period of last year. * Based on the figures released by the Ministry of Land Management, Urban Planning and Construction. 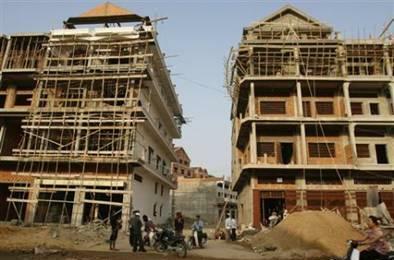 These figures demonstrate that the residential development market in Phnom Penh is in recovery. Lao Tip Seiha, director of the department of construction at the Ministry of Land Management, Urban Planning and Construction, said that it is a good sign, even though the world economic crisis is still affecting the construction sector. He strongly believes the construction sector will see a step-by-step recovery this year. According to the housing development policy for 2010 to 2030, 1.2 million homes must be built nationwide. This should provide a further boost to the industry. Bilateral trade between Cambodia and Vietnam surged by 36 percent in the first nine months of this year, as both governments attempt to reach a US$2 billion trade target by year end. The value of trade between the two neighbours hit $1.287 billion from January to September, up on the $946 million in last year’s first nine months, according to data from the Vietnam Trade Office at the Vietnamese Embassy in Phnom Penh. Secretary of State at Cambodia’s Ministry of Commerce, Ok Boung, stated the signed trade deals between the two nations this year were significant factors which had boosted economic activities. Earlier this month, the minister of industry and trade of Vietnam, Vu Huy Hoang, and Cambodia’s Commerce Minister Cham Prasidh signed agreements on preferential tax rates between the two countries. According to the Vietnam Trade Office, Vietnam’s main exports to Cambodia included machinery for agriculture, fertilizer, seafood and petroleum. Cambodia mainly ships garment materials and agriculture produce such as wood, rubber, cashew nuts, rice and corn to neighbouring Vietnam. France Telecom SA may direct some of its up to US$9.45 billion war chest for emerging-market expansion to Southeast Asia- including Cambodia- as the company’s historic turf in Africa becomes more crowded. Europe’s third-largest phone company may look to expand in Vietnam, Cambodia or Laos. Aline Perrette, deputy commercial counselor at the French embassy in Phnom Penh, noted that France Telecom had entered into negotiations over a share of Cambodia’s market leader Mobitel. A Fourth Malaysia bank CIMB- is set to launch in Cambodia today, bringing the number of banks operating in the Kingdom to 29. The new entry demonstrated the soundness and strength of Cambodia’s financial sector. In Channy, president and CEO of ACLEDA Bank, welcomed the investment, stating this emphasizes the trust in the Cambodian banking regulations and systems, as well as the growth of Cambodian economy. Vice president and advisor to Canadia Bank, Dieter Billmeier, noted that CIMB was a well known, respected and experienced Asian bank that could bring its expertise to the Kingdom. The expansion of Vietnam’s Cai Mep port has been key in driving an increase in the total volume of cargo moving through Phnom Penh Autonomous Port (PPAP) in the first 10 months of the year. It also provided an opportunity for PPAP to attract more business from companies wanting to transport goods efficiently through Vietnam as the Cai Mep port has a direct line to Europe and the United States. Between January and October the total volume of cargo at the port had risen 46% over the same period last year (rose to 52,431 in the first 10 months of the year, up from 35,813 in 2009). 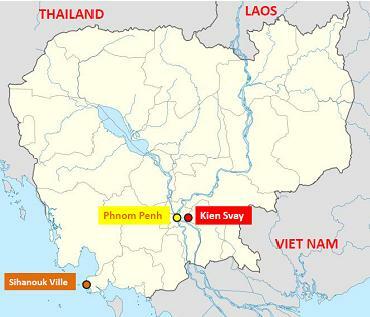 The construction of the PPAP’s facility in Kandal province’s Kien Svay district (Banteay Dek Commune) would help the facility handle the increased cargo levels. This construction of the new 30-hectares, $28 million container terminal was about 25% complete according to the statement of the Mr. Hei Bavy, the general director of PPAP. It is being financed by a 30-year Chinese loan and is located 30 km from Phnom Penh. The new terminal would be able to receive more than 300,000 6-meter containers a year, up from the PPAP’s current capacity of 80,000. The project will be completed by mid-2012. A second Chinese bank – Industrial and Commercial Bank of China, has been granted in-principle approval to operate in Cambodia. ICBC now has six months to meet NBC requirements on registered capital, statutes and potential location. The bank’s loans target mainly the energy sector and construction of hydro-power projects. Currently, many Chinese firms are investing in these sectors. ICBC has branches in Singapore, Thailand, Vietnam, Indonesia and Malaysia. When the three new banks (Bank of China, ICBC & CIMB) come online, the number of commercial banks in Cambodia will rise to 31. Many foreign banks with international standards are investing in Cambodia, reflecting a confidence in political stability and economic potential of investment opportunities. More banks will bring more capital for the development of the economy, bring more technology for the industry, and create more jobs. Commerce Minister Cham Prasidh said that export of garments and textiles would reach $2.8 billion this year, down just slightly from the $2.9 billion figure reached in 2008. While the US still places tariffs on many goods coming from Cambodia, the governments of Japan, Canada and the European Union have granted Cambodia almost completely duty-free access. China and India also provide duty-free access on most items from Cambodia. According to the latest data from the Ministry of commerce, garment exports increased 19.2 percent to $1.59 billion between January and July, with garment exports rising 17,02 percent and 11.64 percent to the US and EU, respectively. The number of foreign tourists visiting the Kingdom has increased nearly 15 percent in the first nine months of year 2010. During this period, a total of 1.803,180 tourists entering the Kingdom via land, air, and sea, has risen by 14.6 percent comparing to the same period last year, according to statistics from the Ministry of Tourism. As stated by Tith Chantha, director general at the Ministry of Tourism, Cambodia aims to meet a goal of 2.5 million international visitors during 2010, up from 2.16 million last year. Air France hence committed to direct flights from Paris to Phnom Penh in 2011.